For the last two years, Mrs Beale has invited us all to take part in the Malvern Hills Walk, in aid of St. Richard’s Hospice. Many of our parents, children and staff took up the challenge and we ended up with a party of over 70 people entering the 5 mile walk. Thanks to the school’s allocation of Sports Premium funding, we were able to pay the £5 entrance fee for each child that took part. We had such a great time (the sunny weather helped ) that we would like to repeat the whole experience this year as well. Even our Reception children managed the walk with ease. If you are unable to take part in the walk, but would like to donate some money, there is a school sponsor form held in the office—or again visit the ‘Just Giving’ page — or use the donation tub at the school office. If you took part last year, we would love you to join us again this year and if you didn't join us last year, please do so this year. BE WARNED—Mrs Beale is on a mission to beat last year's total (£515) raised! More information about St. Richard’s Hospice and the amazing work they do, can be found on their website below. We did it! Approximately 70 of us in total - children, parents, brothers, sisters, grandparents, teachers, teaching assistants and dogs - we completed the 5 mile walk across the Malvern Hills in support of St. Richard's hospice. Mrs Beale was true to her word and organised the best weather imaginable and we all had the most amazing morning! Have a look at the photos, if you don't believe me! On Tuesday 12th April, Jayne Sargeant came to talk to the school about St Richards Hospice and the wonderful support they give to their patients and their families. They support in a number of ways which is funded only by charity donations. Thank you to the parents who came along to listen. 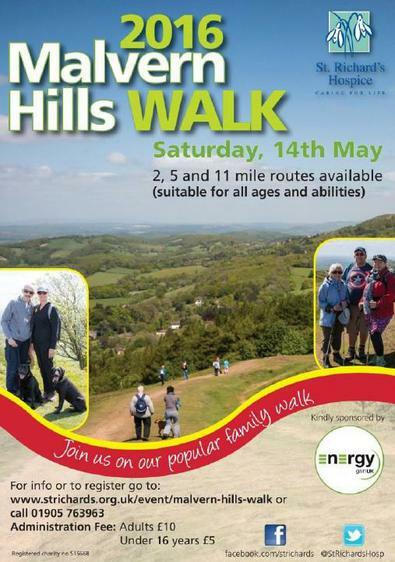 As a school we would like to support this charity by taking part in the local Malvern Hills Walk 2016 on Saturday 14th May at 10am. Mrs Beale is keen for everyone to complete the 5 mile option and have fun together as a group. If you and your family are interested in taking part in this local event and supporting this worthy cause please look out for the posters around school and sign up in the office where there is more information. Some staff have signed up for the walk already so we will be able to take up to 20 unaccompanied children, by prior arrangement. will pay the entrance fee of £5 for any St Matthias child wishing to take part. It is a family event, even dogs are welcome (there may be a treat in it for them!) Entrance fees for adults is £10 and you can sign up in the office and pay your fee there. The entrance fee for any siblings under 16 will be £5, which can also be paid at the office. This is a sponsored event. If you would like to collect your own sponsorship money, please collect a form from the office. We will also be setting up a ‘Just Giving’ page on our school website, if you would prefer to donate through the school. If you are unable to take part in the walk, but would like to donate some money there is a school sponsor form held in the office—or again visit the ‘Just Giving’ page on our website. Jayne has also offered a visit to St Richard’s hospice for any parents wishing to see to see the facilities they offer. She is also happy to give a further presentation to parents in our school hall one evening, for anyone wishing to find out more about the hospice and the service they provide. Please contact Mrs Beale should you be interested in either of these offers and she will contact Jayne on your behalf. Let’s have some fun and hope there is sun! If you would like to donate to St. Richard's Hospice, please click the link below to access our Just Giving page.